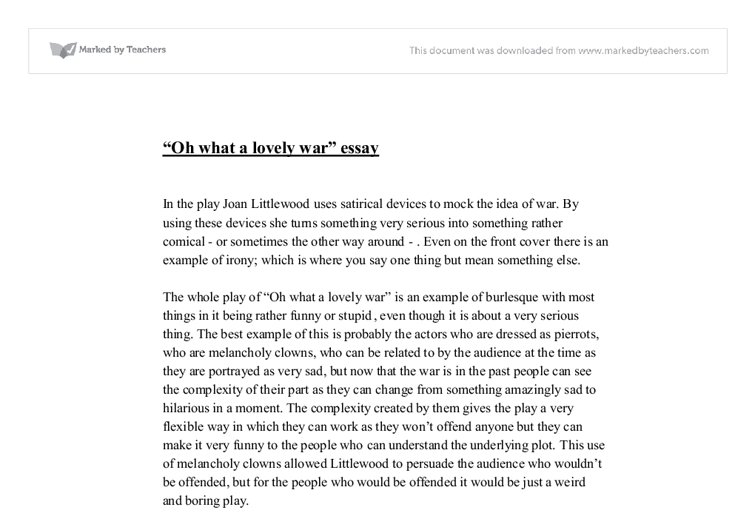 "Oh what a lovely war" essay In the play Joan Littlewood uses satirical devices to mock the idea of war. By using these devices she turns something very serious into something rather comical - or sometimes the other way around - . Even on the front cover there is an example of irony; which is where you say one thing but mean something else. The whole play of "Oh what a lovely war" is an example of burlesque with most things in it being rather funny or stupid, even though it is about a very serious thing. The best example of this is probably the actors who are dressed as pierrots, who are melancholy clowns, who can be related to by the audience at the time as they are portrayed as very sad, but now that the war is in the past people can see the complexity of their part as they can change from something amazingly sad to hilarious in a moment. The complexity created by them gives the play a very flexible way in which they can work as they won't offend anyone but they can make it very funny to the people who can understand the underlying plot. ...read more. For both audiences they would become cynical towards Haig and whatever he says for the entirety of the play. During the war supplies and equipment became in very short supply so training up new recruits was a problem. In the play Littlewood uses rifle training to show the stupidity of the whole system; although it is made to look funnier by the way clowns are acting it out and they are using things like umbrellas. Using this hilarious image Littlewood makes the audience also see the rather serious side by using burlesque. As the sergeant calls out to the men "swing over to the left and bash his head in" any audience, either at the time or nowadays, would laugh but most would soon after realise that they are laughing at people being taught to kill. Zooming out from the play and looking at the reaction of the audience many would be horrified to realise to true meaning of what they are laughing at. This is one of the few serious things in the play although in a lot of it there is use of mocking something rather serious. Throughout the play there is the use of reliance on religion by the leaders of the army. ...read more. The modern audience would also see this but call it a soap opera. 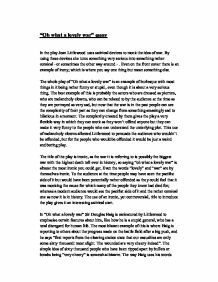 Making the audience see that although the slight differences, they were virtually the same people fighting over a little problem would make them feel that the whole was war was maybe not necessary. Near the start of the play Littlewood gets the audience to question themselves as to if they know why the war actually started. She does this by the use of sarcasm when an Austro-Hungarian and a Serb talk about the murder of Arch Duke Franz Ferdinand. When one asks the other about who did it they both conclude that "it was either a Catholic, a protestant, a Jew, or a Serb, or a Croat, or a young Czech liberal, or an Anarchist or a syndicalist. In any case it means war" This is mocking the start of the war as an assassination of a man everybody hated so what is the fuss about would make both the audiences see how controversial and unjust the start of the war was. The use of satirical devices by Joan Littlewood makes people who supported the war question their reasons for it and make them see the pacifist side of it. For the people who where against the war get more support from other people who have been persuaded. David Busfield ...read more. This represents Stacey as a caring and understanding daughter, when it comes to family. She is not afraid to be with her mentally ill mother who can be a cause for concern and frightening. When Sean and Stacey go home, there is low-key lighting also, to show a sense of foreboding. Each of these roles is typical of the actor who portrays them, and so adds a sense of familiarity to the film, making it easier for the viewers to involve themselves. be like and how he should do it, like "decapitate an entire village...cut open their spleens." Even though Shrek actually says that himself, because of what viewers have seen of Shrek so far they are led to believe he's not capable of doing this even if he wanted to.